Use Ubuntu/GNOME Desktop as Alarm Clock: You may find our Python alarm clock too geeky or complicated, so I thought I should share with you an easier way to use your Linux desktop (particularly Ubuntu and other GNOME-based distributions) as alarm clock. 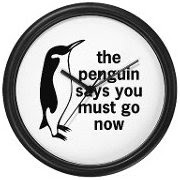 To do this, you will have to install a package aptly called "Alarm Clock". 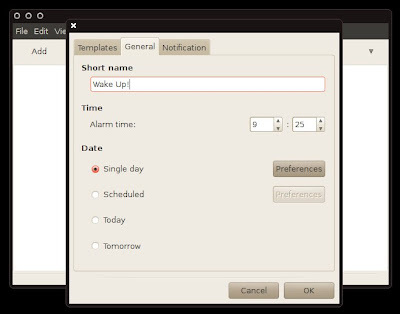 Alarm Clock is described as the personal alarm clock for the GTK + desktop environment. But other than waking you up on time by making noise, it supports other useful features such as passive window reminders, snooze option, and exception lists for scheduled alarms among others. After installation, you can immediately start using the program by going to Applications --> Accessories --> Alarm Clock. Alarm Clock has a simple interface where you can easily start adding new alarm schedules. The alarm clock icon sits on the notifications area. Under "Notifications" setting, you will find some useful options. 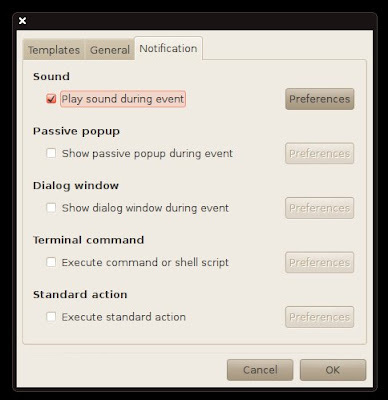 You can set it up to show a dialog window or display passive popup during event, which is good for scheduling reminders and tasks. Advanced option for executing shell script is also included. Under the sound preferences, you are given a choice to use a custom sound file. So if your idea of waking up is hearing the song Wake Up by Rage Against the Machine or any of your preferred song, simply install this Alarm Clock application. at first I was thinking, "who the hell would use a desktop for an alarm clock?" Then I remembered all the nights I passed out on my couch, only a few feet from the PC and then woke up late because I couldn't manage to get to my room where my actual alarm clock is. Nice idea. Simple and easy to use. Also invaluable to those of us not living on a normal schedule. you can use it for many thing from recording movie (using tv tuner) at certain time period, or anything that you can imagine.